Some of our toddlers spend a good deal of time in the car, so it's no wonder they love to incorporate toy cars into their play. Your toddler will love to imitate adult driving behaviors (watch out those of you with road rage) and take her cars to all her favorite places. You may not think she's paying attention while on all those drives, but just watch her play with cars and make all the sounds of starting an engine, speeding up, turn signals, screeching brakes, honking horns and more. She'll talk all about signs, lights, buildings and other sights she's seen all the while demonstrating the growing awareness she has of the world around her. The best vehicles to choose are those that are safe. Small cars like Matchbox brand or others have parts that present a choking hazard to your toddler. Also, don't choose cars that do things that your toddler can do for herself. Examples include cars that make noises and have motors that propel them forward. These features place limits on your child's own imagination and can reduce the open-ended nature of her play. Simple wooden cars are a good first choice. Remember, too, that it's not just cars that are intriguing. Many toddlers are equally fascinated with other vehicles like dump trucks, garbage trucks, limousines, and motorcycles so be sure to keep a good variety on hand to maximize different approaches to car play. Figure out which cars fit into differently sized slots. Sort by type (for example, all construction vehicles in one row or all emergency vehicles together). Choose her favorite toy cars and put them all in one place. Cars are the perfect complement to blocks, so keep them stored near each other to expand your toddler's play choices. She will enjoy using the blocks to construct buildings as well as roads and other structures to knock down by crashing her cars into them. Enforcing your own established rules for clean-up applies to car play as with any other type of toy. A large car collection can quickly lead to a cluttered floor. 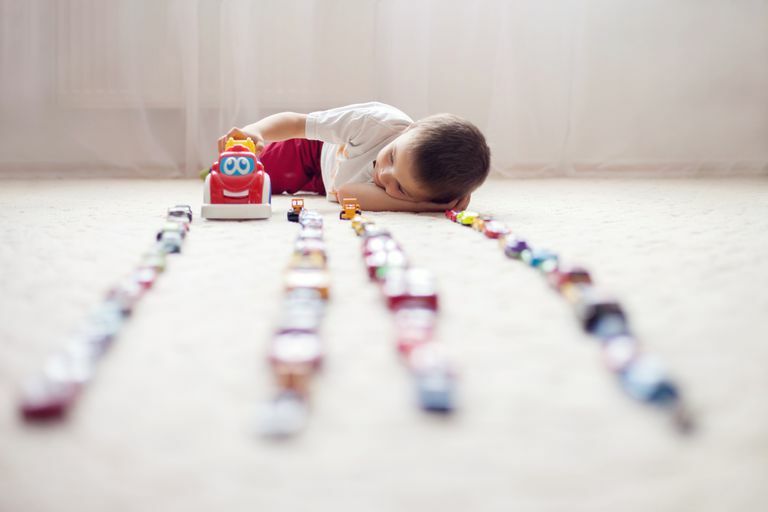 While it might seem like pratfalls involving toy cars are the stuff of cartoon legend, I can assure you that these accidents do happen, so make sure your toddler keeps cars stored away from walking areas. It might be disconcerting to hear your toddler crashing cars into each other or ramming them into block buildings, but unless she's hurting another child, driving into your baseboards or damaging furniture, this is not behavior to discourage. She's just testing out the different scenarios she's learning about (and safely so) through play. It's likely that at some point your toddler will user her imagination to run her cars through the car wash, so make sure that she knows which vehicles she's allowed to get wet. Some cars have metal parts that might rust or otherwise be ruined by water.